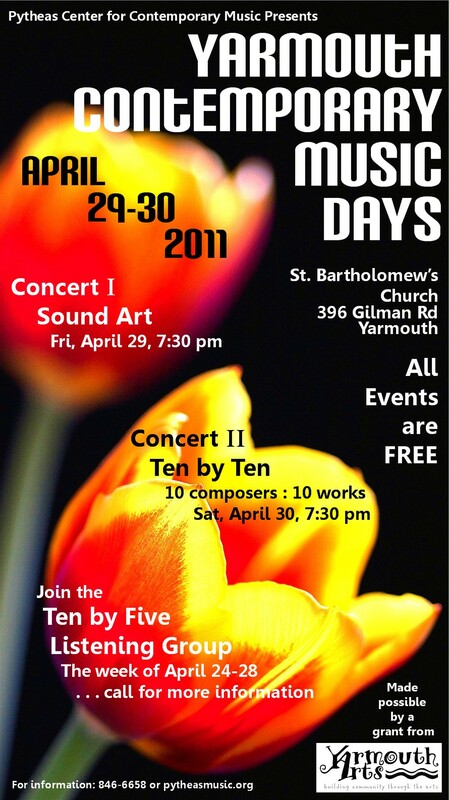 a series of music events taking place Friday and Saturday, April 29-30, 2011, involving Maine composers, musicians, educators, artists, and students. Yarmouth Contemporary Music Days features contemporary music with live performances, sound art and a special listening group . . . This evening's performance made possible by a grant from Yarmouth Arts. And thanks, also, to St. Bartholomew's Church for their support. In addition to the two concerts, the Pytheas Center's website - pytheasmusic.org - will present information related to each event, as a means to extend and expand the cultural experience. Information on the composers will be available, as well as a wide variety of other resources relating to contemporary music. And click here [under construction] for our full poster for Yamouth Contemporary Music Days. Come and enjoy! The Pytheas Center for Contemporary Music - pytheasmusic.org - is a Maine-based nonprofit organization that promotes contemporary concert music. Its mission is to promote the appreciation and understanding of contemporary art/classical music through contact, education and live performance. Yarmouth Arts - yarmoutharts.org - is a non-profit organization made up of local citizens committed to encouraging arts and cultural activities within the community of Yarmouth. Their mission is to enhance the cultural life of Yarmouth community by increasing awareness of existing cultural opportunities; promoting greater participation in the arts and cultural activities for all ages and interests; and facilitating and supporting cultural events and activities in Yarmouth. As a local arts organization, they seek to support the creative community by connecting artists with audiences of all kinds, encourage creativity in its broadest sense, and believing that sharing arts and cultural experiences brings us together.